Former NBA star Dennis Rod­man arrived in North Korea on Thursday December 19 to help train the national team and renew his friendship with the North's young leader, Kim Jong Un, a visit unaffected by the recent execution of Kim’s uncle in a dramatic political purge. 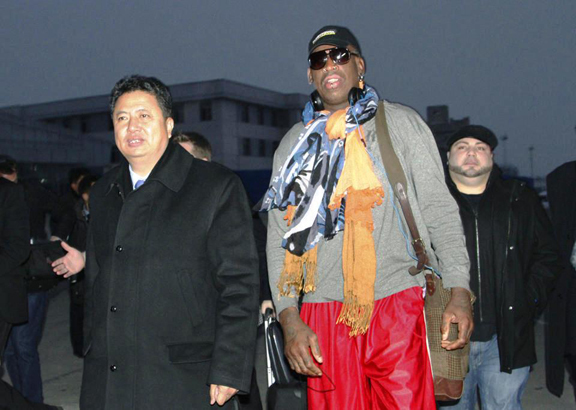 Rodman was met at Pyongyang’s airport by Vice Sports Minister Son Kwang Ho. He made no public comments, but told a mob of reporters earlier at Beijing’s airport that he expected, as on previous visits, to meet with Kim and make final arrangements for a Jan. 8 exhibition game in Pyongyang marking the leader’s birthday. “I know (Kim) is waiting for me to come back. So hopefully we will have some conversation about some things that’s going to help the world,” Rodman said. Jang’s execution marks North Korea’s most serious political upheaval in decades and has sent North Korea watchers speculating over the stability of the Kim dynasty. However, Rodman’s visit — should it proceed uneventfully — could be a sign that Kim is firmly in charge and unconcerned with any potential challenges to his rule. Asked about the execution, Rodman said that had nothing to do with his visit. He said he wasn't worried about his personal safety in the North, despite the recent detentions of two Americans there, one of whom, Kenneth Bae, has been held for more than two years. Rodman and Kim have struck up an unlikely friendship since the Hall of Famer traveled to the secretive Communist state for the first time in February with the Harlem Globe­trot­ters for an HBO series produced by New York-based VICE television. Known as much for his piercings, tattoos and bad behavior as he was for basketball, Rodman has mostly avoided politics in his dealings with the North. He’s mainly focused on using basketball as a means of boosting understanding and communication and studiously avoided commenting on the North’s human rights record, regarded as one of the world's worst by activists, defectors and the U.S. State Department. Defectors have repeatedly testified about the government’s alleged use of indiscriminate killings, rapes, beatings and prison camps holding as many as 120,000 people deemed opponents of Kim, the third generation of his family to rule.